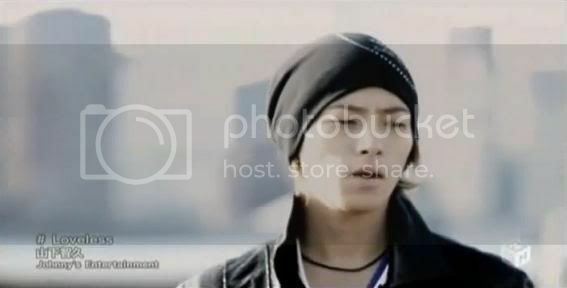 I really love Yamapi. He easily has one of the best voices in NEWS. But does that mean he should get a solo single and concert instead of NEWS? Not so much. However, that doesn’t stop me from loving his song Loveless. Now for the most part I’m not really into ballad type songs. 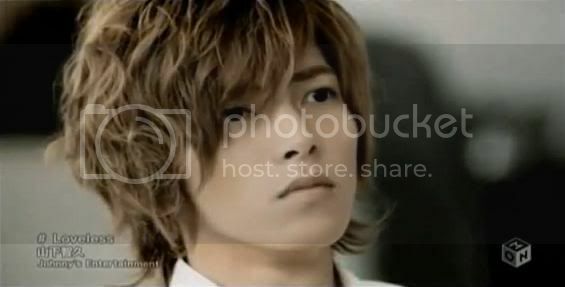 But all of Yamapi’s solo songs seem to have the same format. Sad lyrics and soft music mixed with just enough upbeat music that it’s not completely boring. Well Gomen ne Juliet was like that anyway. The overall way he is singing is great. It’s soft, sweet, and fits it perfectly. But as great as it sounds, I really wish there was at least one high note thrown in there. Heck Tegoshi’s Ai Nante is full of them. And we all know Yamapi can hit them. I don’t know without it, it seems like it’s missing something. The lyrics are pretty good. Johnny’s always does have great heartbreaking lyrics. The lyrics are also a lot better and more mature then any song he’d sing within NEWS. But since I’m paranoid, this makes me think Yamapi is getting ready to leave NEWS. I mean whenever Yamapi releasing a single outside of NEWS it’s for a drama. But he doesn’t have a drama to plug. The PV is ok. It’s not bad, but not great. It’s pretty much what you’d expect from a song entitled Loveless. Lots of sulking and feeling heartbroken. He always flashes a Crybaby single tear in the begining. And despite his hideous hair he does manage to look cute at times. Just not the scenes were he’s wearing a beanie hat. He just looks ridiculously ugly. Designer or not it’s ugly. 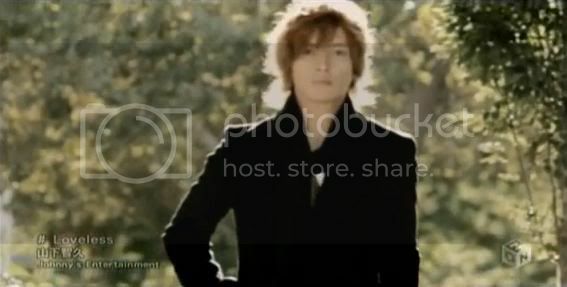 I really hate that this PV was filmed in NYC. I was so close to Yamapi and didn’t even know. At least his tear looks real. Nice outfit, too bad your hair ruins it. You can barely even notice it here. Nothing is hotter than you’re hair looking like a wet dog. Some one out there in H!P must have been listening to me, because Morning Musume released a green dance version for Kimagure Princess. And I gotta say, I’m completely in love with it. The members switching/mashed up dance sequences were probably my favorite part of the entire Kimagure Princess PV. I’m so impressed by this edit that if they decided to pull a Resonant Blue, and just released this as the official version I’d be happy. It really does take very little to impress me. But come on, can anyone really argue that this isn’t the most creative dance shot Morning Musume has ever had? I hardly ever watch H!P dance shot versions because much like the regular Kimagure Princess dance shot version, they’re boring. There’s never much reason to watch dance shots anyway. Unless you want to seriously learn the dance, or the dance is spectacular. And since neither is true in my case, Kimagure’s green dance version is probably the first H!P dance shot I’ve watched from beginning to end. There’s finally something going on to keep my attention on a dance shot for more than minute and a half. It might seem pointless to go on this much about a dance shot, but tell me this isn’t full of win.